As a beekeeper, it’s absolutely essential that you keep the varroa mites in your hive under control. Because it’s never a question of whether you have mites – it’s just a question of how badly you have mites. And, to that end, you need to know your mite count. Varroa mites are an unfortunate reality in modern beekeeping. Native to Asia, they exist in relative harmony with Asian honeybees, their natural hosts. Once they were introduced to the United States in 1987, however, things went south. Beekeepers in the US and many other parts of the world pretty much only keep European honeybees, which don’t have the natural defenses their Asian cousins have. The result is a huge blow to honeybee populations and a constant battle for beekeepers. Varroa mites are just one of many threats facing honeybees, but they are the most prevalent and therefore the most dangerous. If you discover them after taking a mite count you don’t treat for them, your colony may well die. The mites latch themselves onto bees while they’re in their larval stage and survive by biting into the bees and sucking their hemolymph, a bee’s answer to blood. While the blood sucking isn’t pleasant, it’s the bites that cause all the problems. All those bites lead to a lot of open wounds and direct paths for diseases to get into the bees’ systems. Often quite a few diseases will be present in very low levels in a hive, but it’s the varroa bites that make them spread rampantly. This is especially bad for overwintering colonies. Bees are at their weakest in the winter – their numbers are low, their lifespans are being stretched, and they’re putting all their energy into keeping warm and fed. Any disease resulting from mites could push them over the brink, and most colony death from mites occurs during winter. Even if your colony seems strong and well-prepared for the cold months, if you don’t treat it for mites you may very well find it dead in the spring. Varroa mite treatment is necessary, but it can also quite harsh. Occasionally it can cause some die-off in your hive, and most treatments will contaminate your honey. This means you don’t want to treat for mites unnecessarily, and you definitely don’t want to do it while your honey supers are on the hive. The result is a careful game of checking, balancing, and waiting. You’re going to have varroa mites in your hive, but as a rule their population is going to start low in the spring and increase throughout the summer. Your job is to keep an eye on their numbers by taking a mite count and only treat to knock them back when there get to be too many of them. Hopefully this won’t happen until late in the summer when you’ve already collected your honey for the season. So how do you keep track of varroa mite numbers? There are a few methods for taking a mite count, some more accurate than others. The crucial time to check is in high summer, when populations might really be on the rise. It’s also a good idea to check in the spring in case you have an especially bad infestation, and in late summer to make sure your bees are set up to survive the winter. It is possible to see varroa mites on your bees. Unfortunately, by the time you get to the point where this is likely, you probably have a severe infestation on your hands. Instead of looking through the hive and trying to see the mites in action, use one of these methods to obtain a mite count. It’s a good idea, as a very low-level mite weapon, to use a screened bottom board. Sometimes mites naturally fall off the bees to the bottom of the hive. If you have a screened bottom board, they’ll fall through the screen beyond where the bees can reach them. Put a sticky surface on the other side of the screen, and the mites are stuck for good. This helps you in a few ways. First, if any of the mites that fall are alive, they won’t be able to climb back up into the hive. Second, it gives you the perfect opportunity to count your mites. You can buy commercial sticky boards for Langstroth, Warre, and Top Bar hives. You can very easily make your own, however, by applying a layer of cooking spray or petroleum jelly to a piece of stiff paper cut to the size of your bottom board. You can do yourself a big favor when it comes to counting by drawing a grid on the paper (many commercial ones come with this grid). When you want to take a mite count, slide the sticky board underneath the screened bottom board. Leave it for three days, then pull it back out and get counting. Divide your total by three to get an average daily mite drop number. This isn’t necessarily the best method, and if you try it you might understand why. 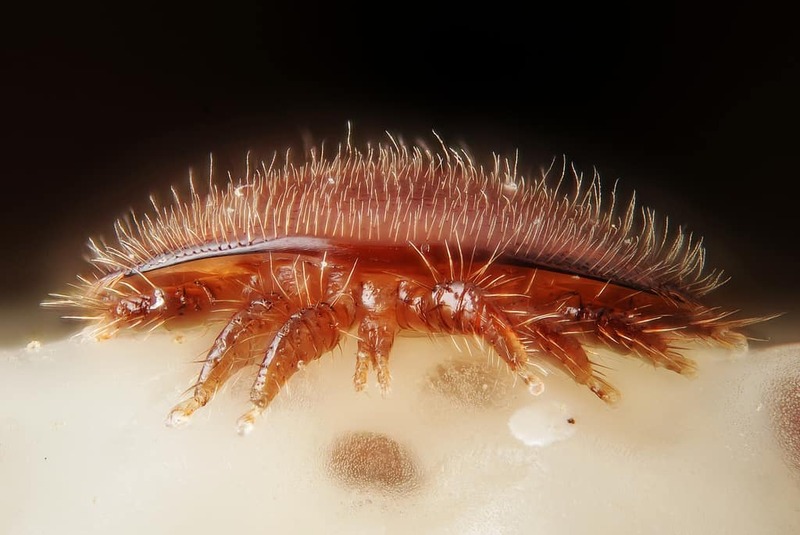 A lot of things fall to the bottom of a hive over the course of three days (wax, dirt, little pieces of who-knows-what) and it all looks very similar to a varroa mite. It’s hard to know what you’re looking at, especially if you’re a beginner. Here’s some of the general litter you’ll find on your board – there’s a blade of grass pointing at the actual mite. This method is more accurate, though it’s more intensive and could be a little daunting. a few spoonfuls of powdered sugar. The first step is to collect a ½ cup of bees. Varroa mites tend to latch onto nurse bees around the brood, so these are the bees you want to test. The one bee you do not want to test is your queen, so do your very best to find her first. If you’ve looked and looked and just can’t find her, then pick two brood frames and make absolutely sure the queen is not on either of them. If you’re sure a brood frame has no queen on it, hold it over the plastic tub and bang it down once sharply. A good number of bees should come tumbling off. Repeat this with your second queenless frame, and you should have a nice big even sample of nurse bees. Using your measuring cup, scoop yourself half a cup of bees, taking care to level off the top. It takes just about 300 honeybees to fill half a cup, which makes for convenient, easy-to-take sample sizes. Dump your ½ cup of bees into your mason jar, put your circle of #8 screen in place, and screw down your canning ring. Sprinkle about 2 tablespoons of powdered sugar through the screen and onto the bees, then cover up the screen with your glove and give the whole jar a really good shake for a couple minutes to really coat the bees. Varroa mites hate the feeling of powdered sugar, and they’ll release themselves from the bees when it gets on them. Once you’re done shaking, make sure to get somewhere out of the wind and turn your jar over (with the screen still in place!) over a sheet of white paper. The mites and the sugar will drop down through the screen, making it easy to count. To get a more accurate reading from your hive, do two jars of bees instead of one and average the count from both. Once you’re done, dump your jar of bees back into the hive. They’ll get the sugar cleaned off themselves in no time. This method is almost identical to the sugar shake, but with two differences. One: it’s believed by many to be a little more accurate. Two: it kills all the bees in your sample. Copy all the steps from the sugar shake until you have the bees in the jar and the screened lid on tight. Then, instead of spooning sugar through the screen, pour alcohol in until it reaches about an inch above the bees. Cover the screen up tight, and shake for a few minutes. The alcohol will wash the mites off the bees, and they should come out through the screen. This time you’ll want to empty the jar over a white bowl instead of a piece of paper. So, when taking a mite count, how many mites is too many mites? Unfortunately there’s no hard and fast answer to that question. The threshold for treatment can vary from season to season, from region to region, and from beekeeper to beekeeper. According to the Rhode Island Beekeepers Association, however, you should treat your hive if your number from the sugar shake or alcohol wash is higher than 3-4 in the spring, 6-9 in the summer, and 9-12 in the fall. It recommends treating if your sticky board numbers over a 24 hour period (that’s your 3-day number divided by 3) is higher than 5-10 in the spring and 5-60 in the fall.